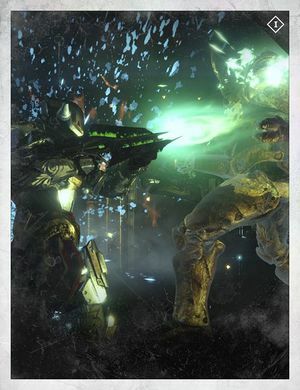 Urn of Sacrifice is a quest given by Eris Morn after completing the Rise of Crota quest in The Dark Below. It rewarded the player with Knightbone Guard, Acolyte Rung, or Thrallskin Brace depending on the Guardian's class. It was made unavailable after The Taken King. Purchase an Urn of Sacrifice from Xûr for one Strange Coin. Kill twenty-five Thrall with Solar Damage from a Fusion Rifle and collect the Embers they drop. Death will reset your progress. Kill five Cursed Thrall with your Melee attack. Death will reset your progress. Defeat Hive Acolytes (one point each) and Wizards (five points each) with Void Damage and collect their Sullen Hearts. Some progression will be lost on death. You need one hundred points total. Kill Urzok, the Hated in Earth’s Skywatch during Public Events. Urzok has an Arc Shield. Return to Eris to start the next part of questline: Ritual of Sacrifice.